Stock photo a close up of the Legislative Building in the City of Regina, Saskatchewan, Canada. The stunningly detailed Legislative Building in the City of Regina, Saskatchewan, Canada. 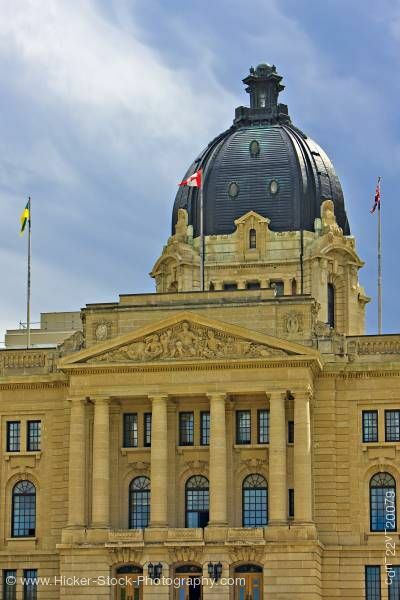 This stock photo shows the magnificently detailed Legislative Building in the City of Regina, Saskatchewan, Canada. A close up of the Legislative Building shows a three story building and an additional floor included with the dome above. The first floor has three archways for the front doors with black lanterns between the doors. There are two rectangular windows on each side of the doors. The second floor has five arched windows, three center windows show between six grand columns. The third floor has ten rectangular windows, six between the columns. The columns and the entrance doors are the center of the building and have a peaked roof style with beautifully ornate carvings. The roof has three flags in front of the dome. The dome has a square platform and two arched doorways and columns. Above is the impressive metal dome.